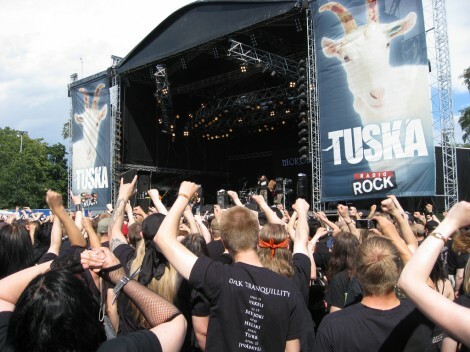 The 12th annual Tuska Open Air Metal Festival takes place in its near legendary location of Kaisaniemi on July 26.-28. This year’s line up features such international acts as NEUROSIS, PAUL GILBERT, PESTILENCE, IMMORTAL, GOJIRA, LEGION OF THE DAMNED and JOHN OLIVA’S PAIN. Finnish experience and heritage is represented by the likes of AMORPHIS, ENSIFERUM and ROTTEN SOUND and new blood is drawn by new comers DEATHCHAIN, MEDEIA, DAUNTLESS and TUKKANUOTTA. Tickets on sale through www.tiketti.fi and www.lippupalvelu.fi. A total of 32 bands on three stages will perform at Kaisaniemi, Helsinki over the course of three days. In addition to this, a couple of dozen bands will be appearing at the infamous evening clubs.